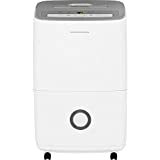 Frigidaire - FFAD7033R1: Dehumidifier Review • The Air Geeks, reviews of air conditioners, dehumidifiers and air purifiers. The FFAD7033R1 is a powerful 70-pint dehumidifier that is optimized to effectively remove excess humidity, and therefore moisture, from your house. This portable unit is engineered to make your room a comfortable place that is free from mustiness and unsuitable place for mold and mildew. So, what is our take about this product that has been a best-seller of the Frigidaire brand for a few years now? Well, if your house is large or medium-sized, then the FFAD7033R1 is a very, very suitable option for you. Let’s get detailed. The first thing that comes to mind when unpacking the FFAD7033R1 is its rather small size. The FFAD7033R1 is a strong dehumidifier that you can fit in a 24.4 inches x 11.6 inches x 15 inches box and that weighs less than 50 pounds. Are you looking for a humidity control system that you can easily move from one position to another? The FFAD7033R1 is a portable unit that allows users to wheel it easily and conveniently from one position to another. 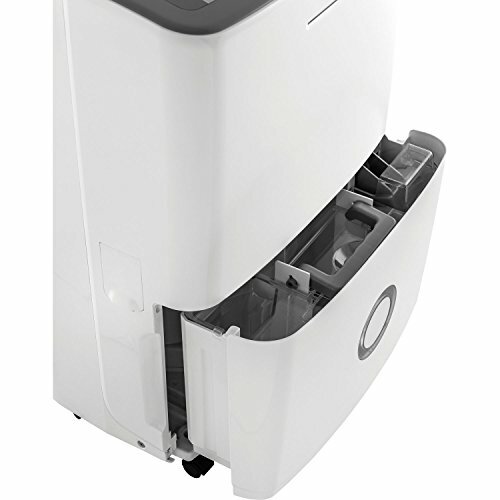 This portable design makes this dehumidifier a suitable choice for large spaces. In addition to caster wheels, this unit features side handles and a top handle for easy lifting. But what about performance, you might ask? As you know if you have studied our dehumidifier buying guide, dehumidifiers are designed to offer different dehumidification capacities : low capacity dehumidifiers are ideal for relatively small rooms and vice versa. Knowing that the FFAD7033R1 is designed to pull up to 70 pints of moisture from the air per day, this makes it an ideal choice for large living rooms, bedrooms, and conference rooms to name a few. While 70 pints looks good on paper, in most “reasonably humid” environments, the unit will draw around 10 pints from the air every day – which is still a great performance. If you live in a high humidity area and you are looking for a strong dehumidifier to remove excess moisture from the air, then this unit is designed to suit your needs. The dehumidifier is not loud, and sounds like a fan on a low to medium speed. This quiet operation is a big plus for most users. 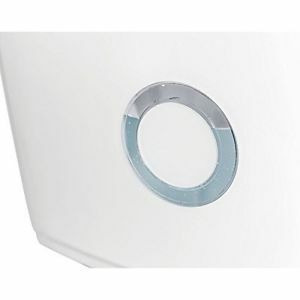 Virtually all dehumidifiers have a reservoir for storing the collected water. This dehumidifier features a 13.1-pint tank for holding the captured water. This tank is ergonomically designed to enable you to lift it when it is full of water. It is also easy to return it. For high humidity places, this powerful unit can fill the tank within hours. You should therefore position your unit near a suitable drain. In addition, this system is designed to allow continuous drain of captured water. To use the continuous drain option, you just need a standard garden hose : we appreciate the unit’s ease-of-use, a great plus in our view. Bacteria and other disease causing microorganisms multiply quickly in high humidity environments. These microorganisms can affect your health if you allow them to breed in your house. The FFAD7033R1 is designed to eliminate these microorganisms before they reach your nostrils. The FFAD7033R1 features Ready-Select electronic controls to allow you to adjust settings with ease and convenience. It also offers digital humidity readout and a 24-hour on/off timer that allows you to program how the unit operates. In addition, this unit offers a control lock. If you are looking for an intuitively designed humidity control unit for your house, then this system is optimized to suit your needs. Last, but not least, it is always important to consider the energy needs of a dehumidifier before purchasing it. Units that consume a lot of power can have a significant effect on your electricity bill. The FFAD7033R1 is an Energy Star rated unit that is designed to consume minimum energy. If you are looking for a dehumidifier that will remove moisture while consuming minimum energy, then this system is ideal for you. Needless to say, we loved the unit. Recommended Room Size 500 sq.ft. Highly effective. The FFAD7033R1 is a powerful dehumidifier that effectively removes excess moisture. Many users have expressed satisfaction with its impressive performance. Quiet operation. This unit produces less noise than most systems of same capacity. However, some have pointed out that the amount of noise produced by this unit can be high if the fan is in the highest setting. No water level indicator. Such a device would make it easier for users to check the amount of collected water, understanding when they should empty the tank. The humidity readings can be inaccurate. Some users have reported that their units do not provide accurate humidity values. No a big deal, but still an imperfection. This dehumidifier works great. Much quieter then the one I had to replace that quit working. Really easy to remove the full bucket and carry to the sink to dump. A full container isn't that heavy, about 13.5 lbs, to carry with the single handle and to dump. I have a very large basement that had a high humidity of 60-70% or so it would fill the 13.1 container pints within the day, 12-24 hours. That is a lot of water it is pulling out of the air. My wife complained about mildew smell in the basement that she couldn't stay in there long. We would also get white mold on the stuff in the basement. I have read that you should keep the humidity below 50% (set to 40-45%)if you don't want mold so I set it on 45% relative humidity and after about a week of use it brought our very large basement to 45-50%. It does feel a lot drier and should eliminate the mold. I highly recommend this. It just really easy to use and works great. Nice and quiet too, about the same noise as a small window a/c unit running. When the basement is cool (60's) the humidity is low and the unit runs but don't pull much water. It works best in warmer weather (70's) which is when the humidity is high and mold can grow, warm and moist. So, I only run it during the spring and summer months to save electricity cost. I used the bucket for about 2 weeks to try it out and then I switched to the continuous drain tube which I connected a piece of clear vinyl tube (1 1/4 inch outer dia, 1 inch inner dia) from Home Depot which I connected to a "T" connector that I installed on my A/C condensation line that runs outside. Since it is only gravity drain (no pump) I had to place my dehumidifier above the drain connection. I could have used a short piece of water hose but I like the clear tube so I can see that the water is flowing so I can check to make sure it is working." I bought this new model FFAD7033R1 and last year's model FAD704DWD at the same time, curious to see which would perform better. Each seems to do some things better than the other. New model FFAD7033R1 positives/negatives worth noting: Good: Works just fine! Bad: Intake is in the rear, and vent is out one side; this means you can't place the unit next to a wall without positioning it so that the intake and vent are unblocked. This isn't a problem for me, but it could be annoying to people who use it in compact living area. Annoyance: the tank doesn't have an easily-visible level indicator. I solved this by putting a float into my tank. The tank is also a little awkward to remove. Last year's model FAD704DWD positive/negatives worth noting: Good: The vent position is great -- intake in the front and exhaust out the top. Bad: Flimsy handle broke after two weeks. I will probably make a new handle. All other things being equal, I couldn't tell you which one I like better or not. But I'm glad to have two humidifiers in my house, which really needs them both." The FFAD7033R1 is a quiet and highly effective unit to create an unsuitable environment for mold and mildew. In addition, this dehumidifier is an Energy Star rated appliance and it is designed to deliver optimum performance while consuming minimum energy. However, not everything is perfect! Although a large fraction of users is impressed by the performance of this unit, some feel that the unit should have a water level indicator. Some have also complained about its humidity readings arguing that they are inaccurate. Having considered the strengths and drawbacks of this unit, it deserves in our view a 4/5 rating.